Display your Texas pride with decorating accessories from our online Texas Kitchen Decor store. Choose dining products from our Texas home decor and Texas dinnerware collections and from Hartstone Pottery, Pickard China maker of America’s finest china dinnerware, Sky Ranch dinnerware with its signature cowboy and cowgirl and other images of western ranch life all great for casual dining, and True West dinnerware which celebrates the ranch themes of western artist Till Goodan. Or for additional Texas decor ideas, check out our Texas themed hardwood cutting boards for cutting anything from veggies for the grill to fajita and barbecue brisket. Also, check out our line of reclaimed wood vignette-friendly wooden cubbyhole cubbies for seasonal change outs in kitchen and dining areas. With a name like Texas Crazy, we love to help you show off the Lone Star State with high quality dinnerware and custom hand made hardwood cutting boards that features well known Texas decor symbols. 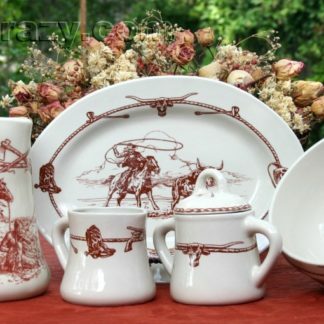 For more details on these western themed Texas kitchen decor products, click on any picture below.